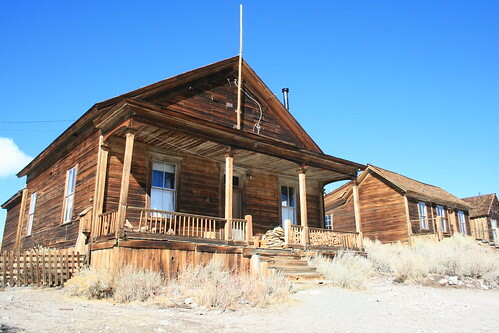 An abandoned home in Bodie, now a ghost town. Just a little while after the gold rush in California started, a man named Body discovered gold in a hole he was digging a rabbit out of, in what is now the ghost town of Bodie. Somehow, it exploded into a huge mining town as word spread, and eventually had 10,000 people living there. That's amazing considering where it's located (all secluded in high desert mountains at 8,375 ft). 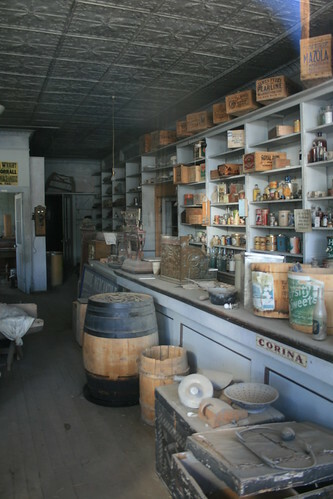 In its day, it had 2,000 buildings, and 65 saloons along a mile long main street! 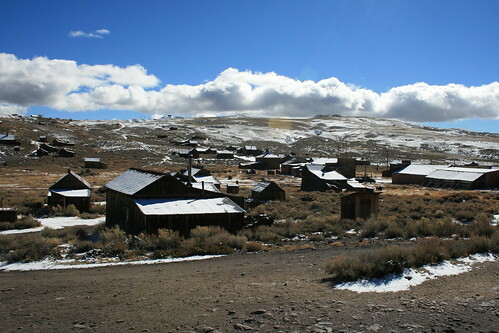 More than 20 million dollars worth of gold was mined out of Bodie. Eventually, it went bust, and by 1915 it was officially a ghost town already. People still lived there for a long time after it was abandoned. I'm sure there were some squatters too. In the 60s it became a state park and the few buildings that were left are now preserved in arrested decay. A gymnasium and a bar (I think). When we went to visit, there was already snow on the ground. It was pretty cold and windy, but we put on a bunch of clothes on and hats and went out into the town. Most of the buildings were locked closed, but one of them was open to walk around in. All of the furniture was left like it was when abandoned, and a huge layer of dust had collected on top of everything. I thought the kitchen was most interesting. 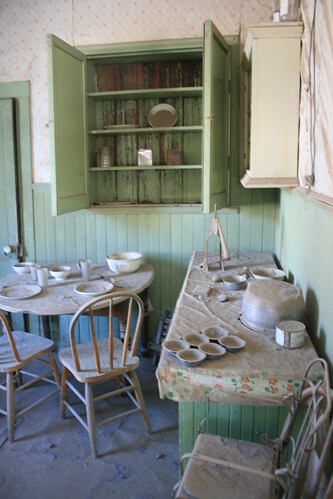 Abandoned kitchen, but a beautiful pastel color. Some of the buildings looked better than average. When we got up close, we realized that was because people (the park rangers) were living inside! I thought that was neat. I wonder if the buildings are haunted. 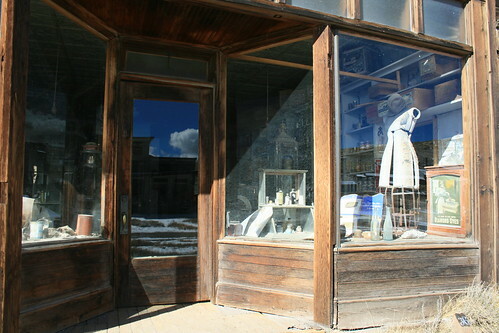 One of the hotels in Bridgeport, the larger town in the valley west of Bodie, has a hotel that was ported piece by piece from Bodie. Its called the Victorian Hotel, and its right on the main street running through town (Hwy 395). Once we met a local guy who told us he knew the maid who worked there. She said that it was totally haunted (although the hotel isn't known/famous for its hauntings, just its history). She said that she would see figures down the hallways and when she was making the beds, she would feel the presence of other beings in the room. One time, she even saw somebody sit down on a bed, except there was nobody there, only an imprint! I am so determined to go stay at the hotel, but nobody wants to go with me, except Nicole. Once she moves here, we will go together. Many of the buildings were insulated poorly, with only cardboard or cloth lining the thin wooden planks that made up the walls and ceiling. Maybe that's why people drank a lot there - to stay warm in the winter! I heard that it had almost no police. The few policemen who patrolled the town were extremely corrupt themselves. Many disputes were settled personally, and violently. A lot of people killed others, and it was supposedly one of the most dangerous towns in the wild wild west. 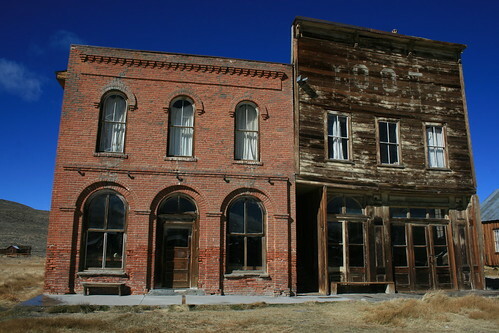 The town of Bodie (what's left of it). 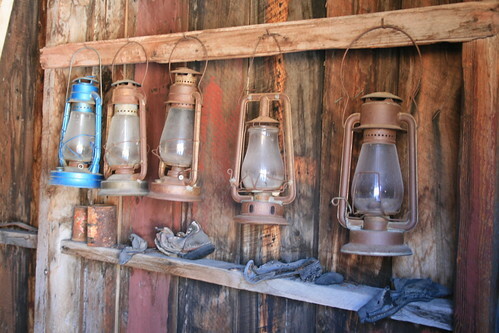 Lanterns all hung up in a row inside the fireman's garage. I think this park is best seen in winter, when all the crowds leave and the ghost town seems more like a ghost town - deserted, cold, and silent. We drove by it once in the summer a few years ago about 1/2 hour before it was closing for the day and it was just packed with people. That day we decided to come back another time, and I'm glad we came back at the end of October instead, what happened to be the eve of Halloween (while everyone else was having some wild Saturday night halloween parties, I'd image). All the crowds were gone. There were only about 4 other cars in the parking lot. 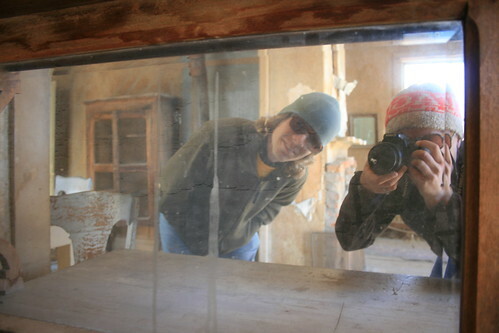 Self portrait inside one of the houses in Bodie. One of the rangers' residences. 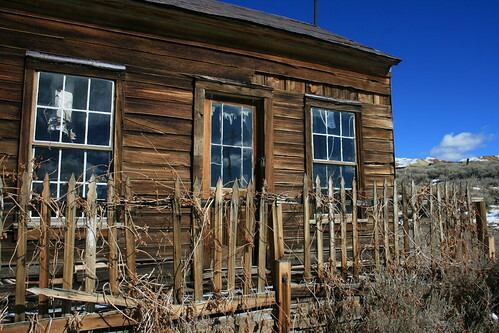 Half the fun of going to Bodie was the drive to Bodie. 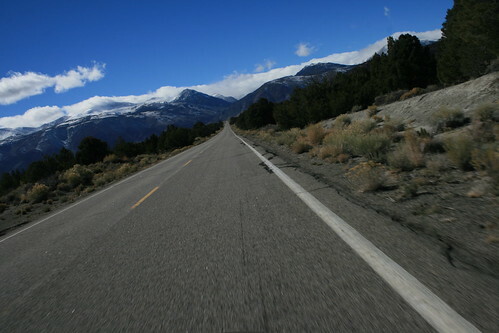 Driving down CA 167, one of the many roads that lead to Bodie. Far off in the mountains, where only one narrow and winding single lane road cut from the side of a mountain will take you, in the middle of nowhere, is a tiny place called Mono Hot Springs. I don't know why its called Mono, because its not in Mono county and its not really near Mono Lake. It sits in a valley between towering mountain peaks in the Sierra National Forest on the western slope of the Sierra Nevada mountains at about 6,500ft and has jaw dropping views in all directions of granite domes and jagged peaks. Topping out at Kaiser Pass, on the way to Mono Hot Springs. To get there, we had to first drive to Fresno (where we were heading to buy a whole trunk-load full of VW parts for cheap). Out of Fresno we took route 168 which heads straight into the mountains. It climbs pretty quickly and about 50 miles later, ends at Huntington Lake. This area is a big recreation place for fishermen, hunters, hikers, but most of all, the 4x4 off roaders. There are Jeep trails all over the place. But we were heading for the hot springs, which were still about 20 miles away from the road's end (and we were driving the Daewoo anyway). 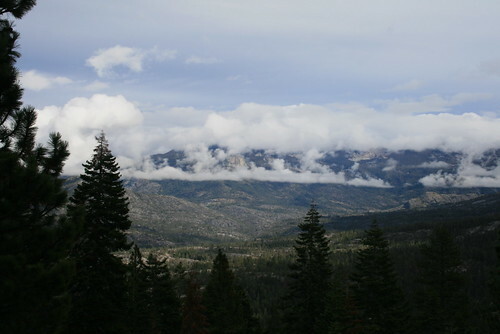 Clouds hang around the mountain peaks in the John Muir Wilderness. 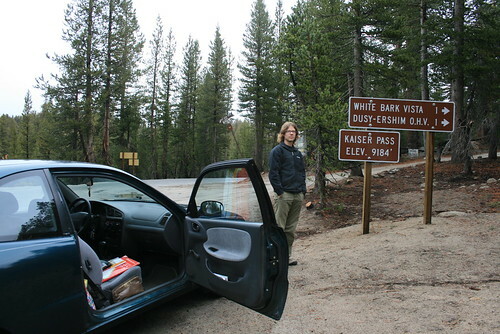 From where the main road ends, you get on Kaiser Pass Road. Now don't let the name fool you. This road, although paved, is not what I would consider a road. It is basically a strip of asphalt about as wide as one and a half cars, that was laid over a trail. When large boulders or cobbles protruded out of the ground, they just paved over it all, and left the tops of the cobbles sticking out of the pavement! It snaked its way around trees, big boulders, and literally had you perched against the mountainside. One wrong turn and it would not be exaggerating to say you would drive off the side of the mountain! It took nearly an hour to arrive at the springs, but the views from this road were awesome! 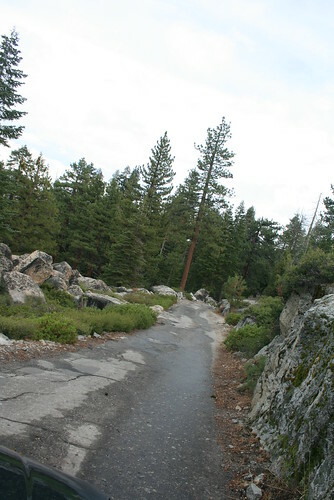 The 15 miles long one-lane 'paved' Kaiser Pass Rd to Mono Hot Springs. 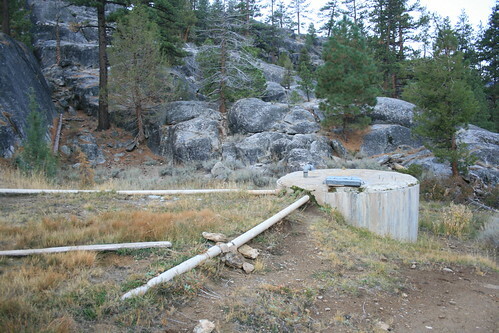 Mono Hot Springs is a rustic "resort" along the south fork of the San Joaquin River. It has cabins, a cafe, a small general store, and a hot tub complete with massages. But we had no plans to patronize this place (and its outrageous prices) because we were headed to the abandoned resort, which was just across the river. I'm not sure when it was in operation, but in modern times it now lies in ruins. The wooden structures have all been torn down or rotted away, but the concrete, however, remains. 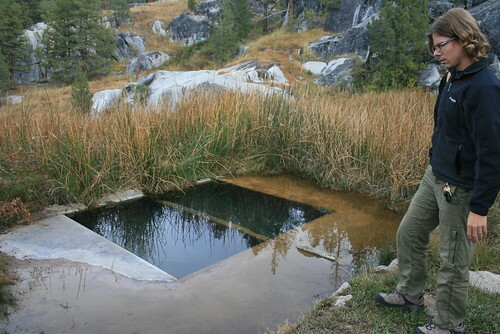 So littered around the otherwise pristine forested mountainside that slopes down to the river, are large and small concrete tubs, holding tanks, and plumbing which still channel the natural hot spring water bubbling from the ground. 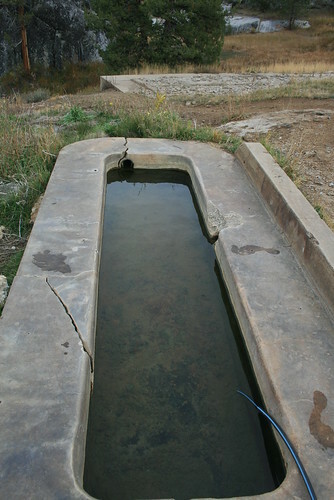 An abandoned concrete holding tank at the old resort. 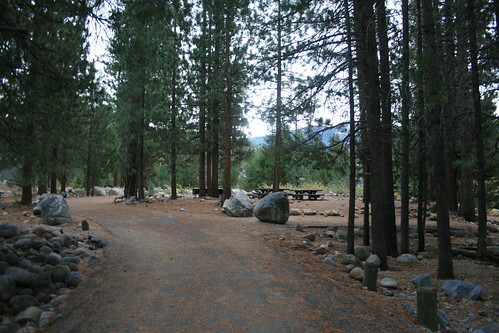 Next to the modern resort is a forest service campground also named Mono Hot Springs. From there, we crossed over a log that spanned the river to get to the south side, where the abandoned tubs were. The tub closest to the river (and also the deepest) was already occupied by a family. So we explored the other ones. We found a couple deep ones, but they weren't very hot (a little below body temperature). We also found a small bathtub shaped one (long and skinny) which was a pretty good temperature, about 98 or 100 degrees. Another bathtub sized concrete tub from the abandoned resort. We ended up taking that tub because we saw more people headed our way. It seemed like this was suddenly becoming the cool place to hang out! All the tubs were either directly fed by the hot spring, or had PVC or rubber piping feeding in hot water from a source not too far away. I guess the abandoned resort built some of the tubs directly on the sources or something, because we couldn't find plumbing to some of them yet they still had water flowing from the bottom somehow. Soaking in the bathtub. Romy's foot graces the photo. Our tub had a lot of algae growing on the walls and corners, but not on the floor where you sit. The water was surprisingly odor free (no sulfur smell at all). Since we visited Iva Bell hot springs a while back, which had small worms swimming in the water, I always check. There were no living organisms that I could see with my naked eye, so I figured it was ok to sit in it, like countless many people before us did. While we were soaking, we watched the hanging remains of rain clouds circle around us and hover over the mountain peaks. It was really quiet outside, and all we heard was the flowing river below, and the birds singing after an afternoon rain shower. More abandoned plumbing from the old resort. After a few hours, we decided we needed to head out of there before it got dark. Mainly because we still needed to go over the 9,100 ft Kaiser Pass and we were afraid that some of the rain clouds might dump snow instead if the temperatures got any lower. So we headed out on our way. While we were soaking, the fog started rolling in, which we didn't notice. So we drove along the one lane winding road enshrouded in mist, like driving through creamy milk. As it got darker and darker, it began to get hard to see more than 10 feet in front of you. And then the Daewoo decided to be lame, and our lights went out! Thankfully the flashers and parking lights stayed on, but other than that we were completely in the dark and in the fog. Oh yeah, and on a crazy mountain road too! The adjacent forest service campground was nice. Well, it turned out that the fuse blew because the dumb wiring melted, so our lights were really not going to turn back on (like they sometimes do if you hit them). We had our flashlight, which at this point was just as powerful as our parking lights in lighting up the way, so we tried shining it in front of us. The light just scattered everywhere due to the fog, so with just the parking lights on, we went slowly down the mountain (well, first up to get over the pass, then down). Somehow, we made it back down, although very very slowly! After that very intense hour, we found a 4x4 trail and pulled off. Since we had no lights, and it was already dark, we had nowhere to go except to sleep. But it now started pouring rain, and we didn't feel like building the tent and getting soaked while doing it. So we got pretty creative in the Daewoo and unbolted the rear seat backs to make a bed in the back. Our feet went in the trunk, and we padded the gap between the back seats and the front seats with stuff. We were able to fold down the front seats and stretch all the way out long ways! It was the best car sleep I ever got! Daewoot!